In the beginning, we learn that chrysanthemum is “… imbued with the qi of the four seasons.” Chinese medicine and philosophy hold that each season is associated with a particular quality, i.e., “qi.” Each of the four seasons is associated with an organ and an “element.” In a way, an organ is interchangeable with an element or a season so long as the assignment is fixed, which is the case in Chinese medicine. “… it embraces the frost and succumbs to the essence of metal and water.” Metal and water are two of the five elements that are formed as consequence of the two–the yin-yang dynamic. The five elements are a hologram that works very much like those collapsing Russian dolls that get pulled out around Christmas. The weather, the seasons, the cardinal directions, the body, the universe, all constitute layers at which the relationships which govern the five elements take effect. The relationship of metal to water is the relationship of the lung and kidney respectively. Within five elements metal precedes water and is consequently considered the mother of kidney. This is reflected in the Yellow Emperor, “The lungs govern moving water” (肺主行水). Chrysanthemum is sweet, bitter, and slightly cold. It affects the lung, liver, and kidney. The lung and kidney are the organs alluded to in the excerpt above. Again, “lung governs the moving of water.” The Yellow Emperor states “kidneys govern water.” Therefore, chrysanthemum has the dual function of working lymphatically (movement of water) and excreting. Every flavor has a property that also corresponds to the five elements. The organ affected by the particular herb trumps flavor. For example, even though the flavor “sweet” naturally gravitates toward the spleen, chrysanthemum goes to the liver, lung, and kidney. This means that its sweetness takes greater affect in the liver, lung, and kidney than the spleen. Every flavor has a property that can be characterized as yin or yang. Sweet is yang and bitter is yin. Yang and yin are not fixed concepts but functional descriptives. Sweet, for instance, nourishes. Whether nourishing is consider yang or yin depends on the context. Yin as a noun is substancial. Yin as an adjective describes the action of subtraction. Sugar has the action of addition so it is considered yang relative bitter, which is draining and yin in action. 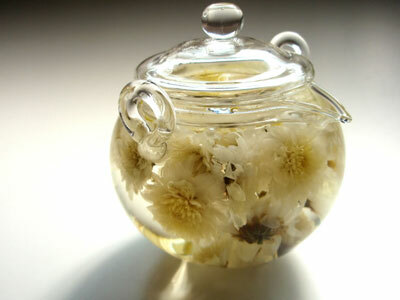 Chrysanthemum is perfectly balanced in terms of flavor, functionally embracing the dynamism between yin and yang, bitter and sweet. Chrysanthemum’s temperature is slightly cool. Flavor only describes functional qualities but temperature describes the thermal effect of the herbs. Cool is yin relative yang, which is warm. In summer temperatures or for individuals who run warm, cooling foods can help with irritability, restlessness, malaise, and headaches. The draining properties of bitter help to gently ease the bloating that many people feel in summer months. So far, perhaps we’ve learned some of the approaches applied in Chinese herbology by discussing the wondrous chrysanthemum. In a later post, the qualities of bitter will be further elaborated in the context of summer.